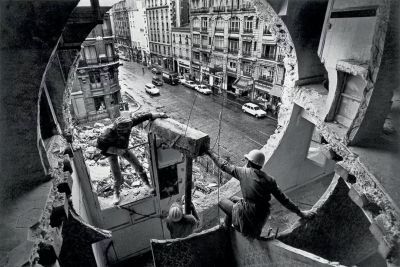 Gordon Matta-clark is an artist. The work of Gordon Matta-Clark (1943–1978) fundamentally changed our understanding of the role of architecture in everyday life. He studied architecture at Cornell University (1962–1968) and became one of the central figures in the New York art scene of the 1970s. Matta-Clark is best known for site-specific installations in abandoned houses scheduled to be demolished in New York, Paris, Antwerp and elsewhere. He revealed the chaos behind the seeming orderliness of the urban space and exposed the conflict between living spaces and architectural structures. Matta-Clark belonged to the artistic community gathered around the alternative art space at 112 Greene Street and the restaurant FOOD in SoHo, and conceptualised the idea of “anarchitecture” (a conflation of the words “anarchy” and “architecture”). “Anarchitecture” referred to the creative practice that paid attention to the shifts, voids and non-places in the urban space. The exhibition includes photos and films of Matta-Clark’s performances and installations. Anu Vahtra (1982) is an Estonian artist who has studied photography at the Estonian Academy of Arts and at the Gerrit Rietveld Academy in Amsterdam, and is the winner of the 2015 Köler Prize Grand Prix. Vahtra is interested in spatial and architectural environments, including specific aspects of gallery and museum spaces. Through subtle changes, her installations reveal the otherwise overlooked aspects of spaces. At the Kumu exhibition, Vahtra has conceived an installational environment for Matta-Clark’s works based on the design of the preceding exhibition in the Great Hall, Wild Souls. In the Kumu courtyard, Anu Vahtra has created an installation that recalls the former limestone quarry at the site of the museum and enters into a dialogue with Matta-Clark’s work. The exhibition additionally includes a slide show of the architect Jüri Okas’s photo series The Concise Dictionary of Modern Architecture (1974–1986) and the documentation of Anu Vahtra’s performative walk Open House Closing. A Walk at the Performa Biennial in 2017 in New York. On Thursday, 21 February at 4:30 pm, before the opening of the exhibition, Sergio Bessa and Jessamyn Fiore will give a guided curator tour in English. The exhibition has been organised by the Bronx Museum of the Arts in cooperation with the Art Museum of Estonia.